This paper addresses an increasingly observable but until now hardly examined phenomenon: how individuals, highly engaged with the symbolic value of architecture, appropriate modernist housing estates, progressively replacing the former residents who are mostly indifferent towards architecture. This process, long yearned for and welcomed by experts and culture lovers, is considered here as a form of ‘displacement through architecture’, or a type of gentrification that is anchored in the high appreciation of architecture. Using the example of the Vienna Werkbund estate (1932), an icon of modernist architecture that was declared as a national monument in 1978, this sociocultural change is illustrated by two user profiles representing the prevailing type of the ‘fully engaged connoisseur’ and the declining type of the ‘indifferent resident’. The paper employs ideas and concepts of Pierre Bourdieu to better understand how the economy of symbolic goods – of which architecture and architectural heritage are a part – works at the micro level of the users. The central argument is that monumentalization of architecture is a state supported hegemonic project of a cultural elite leading to exclusion of low-income and culturally less inclined residents in the long run. The social distinction value of architecture is relatively well studied in termsof contemporary attention-grabbing iconic architecturedesigned by “starchitects”, also known as “Bilbao-effect”(Sklair 2006, 2010, 2012; Jones 2011). However, architectural iconicity occasionally also applies to more modest, unimposing buildings. As can be observed with modernist estates from the interwar period – the Quartiers Modernes Frugès (1928) in Pessac, the Weissenhof estate in Stuttgart (1927) or Uncle Tom’s Cabin estate in Berlin (1926-32) – as well with housing projects built at a later time – for example Le Corbusier’s Cité Radieuse in Marseille (1947-52) or Siza Vieira’s Bouçain Oporto (1977) –, plain residential buildings, originally built for low-income households, have also become both objects of architectural pilgrimage and sought-after properties for connoisseurs coming from the ‘cultured’ but not necessarily well-to-do middle-class in recent years. In the course of symbolic upgrading (the classification of the houses as national monuments or occasionally as World Heritage Site) original residents, often unaffected by architecture, more and more have been replaced by individuals highly engaged with the symbolic value of architecture and the fame of its producers. The present article examines this change by using the Vienna Werkbund estate as a case study. It does so by presenting two profiles – representing the emerging resident type of the ‘fully engaged connoisseur’ and the declining type of the ‘indifferent resident’ – in more detail. The objective is not simply to show evidence for different tastes being expressed in work on the homes, but rather to recall the unequal conditions of appropriation. This ethnographic micro study gives a brief insight into a more comprehensive work on the Vienna Werkbund estate still in progress. Theoretically, it is underpinned by Pierre Bourdieu’s sociology of culture, especially his science of symbolic goods comprising an analysis of the production of the cultural (in this case architectural) work as well its consumption (Bourdieu 1984, 1992, 1993). His analytical framework not only helps to explain the estate’s symbolic value – by reconstructing the process of its canonization, heritagization and iconization –, but also to ground the practices of appropriation in objective social structures and relations of inequality. Considering the appropriation of listed houses as consumption1of “legitimate culture” (Bourdieu) the estate’s sociocultural change is interpreted here as a form of displacement through architecture. It is argued that the replacement of culturally less inclined residents by connoisseur residents is the result of a state-sanctioned imposition of an aesthetic norm implicitly incorporating notions of architecture as original and correct habitation. In contrast to field-internal interpretation following the logic of appreciation (and thus producing the cultural value of the objects which is assumed to be a feature of the objects), this external analysis does not take claims about the estate’s significance and its preservation at face value. It rather draws attention to the manufacture of the cultural value of architecture and stresses the power-relations and exclusionary effects underlying the aesthetic program of monument preservation. As an understanding of the symbolic production of architecture is essential for an explanation of the sociocultural change in focus, at least some fundamental assumptions should be made first. We can assume that houses only can take on meaning as ‘architecture’, ‘architectural icon’ or ‘monument’ within a specific discourse (Hall, 1997). It is the discourse of architecture and architectural heritage or what Smith (2006) calls “authorized heritage discourse” (AHD), which is a precondition of the existence of architecture as a valuable cultural product. According to Bourdieu, a full explanation of the architectural work or icon (as well the fame of its producers) is neither to be found in individual creativity and aesthetic properties (even though formal and aesthetic significance sometimes plays a decisive role, especially in what Sklair (2006) terms Iconic II, nor in some sort of determinant structure, it is found in the history and structure of the architectural field, its institutions and practices. In other words, the present status of the Werkbund estate as monument and icon of modernist architecture has a complex institutional framework as a precondition. The production of the estate’s cultural value or, which amounts to the same thing, of beliefin its value is, in the first instance, the product of those who ‘inhabit’ the architectural field (and who are at the same time ‘inhabited’ by its institutions) – that is, besides the producers, mainly the professional interpreters (critics, academics, museum curators) and the experts concerned with monument conservation. But actors situated outside expert culture – intermediaries, such as journalists, as well as private persons using new information and communication technologies– also contribute to the (primary pictorial) dissemination of the estate and are, thus, co-producers of the estate’s cultural value (Aigner, 2015a). The Werkbund estate’s cultural value is not only shaped by diverse institutions, practices and agents, but also over a longer period of time. That is why I propose to distinguish three phases of symbolic production: the estate’s canonization, its heritagization and iconization.2These modes or, in this case, the consecutive steps of manufacture of cultural value, provide a framework for the following presentation of the estate’s history – sketched here as symbolic biography. The symbolic career of the Werkbund estate started with a firework of public attention in 1932. 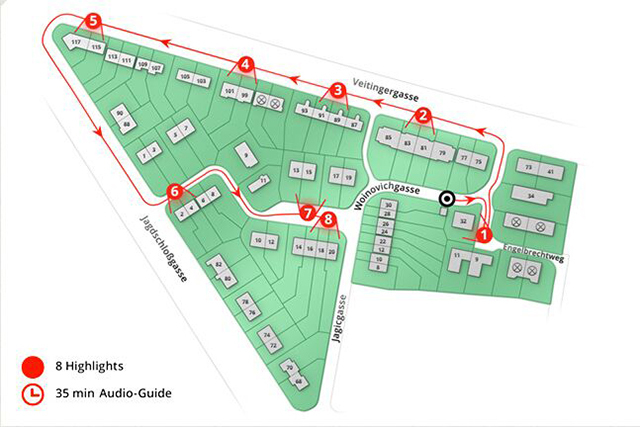 As one of a series of international architecture exhibitions initiated by several European Werkbund associations, the experimental housing estate at the western outskirts of Vienna’s noble 13thmunicipal districtwas both a big event in the competitive field of architecture and an act of national self-display(Aigner, 2015b, 2012; Nierhaus and Orosz, 2012). The display of 70 model houses designed by thirty-one European architects (well-known as well as unknown) offered a unique sensation, attracting more than a hundred thousand spectators. The event was widely reported in professional circles, the local press and beyond. Josef Frank, the spiritus rector and artistic director of the estate, gave lectures (partly broadcasted on radio) and published an exhibition catalogue (Frank, 1932). Although the exhibition was a success in terms of public attention and symbolic economy,it was an economic disaster. In view of the economic crisis, only fourteen of the seventy houses were sold. The intention was to show a model of modern living ‘affordable for everyone’. In fact, the detached, semi-detached and terraced model types with an average living space of 69 m² (742 sq ft) were far beyond a normal worker’s reach.The middle class – for whom they were actually tailored – was partly too conservative for the unaccustomed aesthetics (undecorated cubic structures, flat roofs) and also financially over-burdened. Thus, the 56 unsold houses were rented out in subsequent years, mostly to clerks, teachers, merchants and freelance professionals (Sauer, 2012). In 1938, ownership of the rental units passed from the GESIBA3to the Municipality of Vienna. From then on, the allocation guidelines of social housing took effect. Until today, following the destruction of 6 houses during World War II, the majority of the original houses, forty-eight in number, are inhabited by council tenants, and sixteen houses are privately owned. To a certain degree property relations are indicative of the estate’s social structure: until recently, council tenants mostly came from lower-income strata; owner-occupiers tend to be financially better-off members of the middle-class. The exhibition hype in 1932 was followed by decades of deep sleep in terms of attention. Since the 1960s, initially rather slowly and as an insider tip, a younger generation of architects began to ‘discover’ the estate as architectural legacy. With this second phase of field-internal interpretation – comprising comprehensive academic work and presentations as well as the estate’s inclusion in standard works of architectural history and architectural guides – the estate was integrated into the canon of significant Viennese buildings and of European modernist architecture (Aigner, 2012:268). In the 1970s, after some 40 years of use and based on canonization work, the process of heritagization began to take place. Following the criticism and cries for ‘rescue’ from architectural circles – the houses were in a poor state of repair and partly transformed by their inhabitants4–, the Vienna city council passed a resolution for renovation. In order to carry out a ‘cleansing’ renovation (i.e. a renovation that made it possible to eliminate residents’ alterations) the estate was declared to be a protected zone under Article 7 of the Vienna Building Law in 1978; the federal monument agency (Bundesdenkmalamt/BDA) additionally classified each of the remaining sixty-four ‘original’ houses as national monuments. Between 1983 and 1985, the outer shell of the 48 council houses and of two private homes was renovated and widely reconstructed ‘true to the original’ under the organisational management of the municipality. The imposition of an aesthetic norm requiring the elimination of the users’ adaptions caused considerable conflicts (also reported in newspapers and television)5. Although celebrated as a success in professional circles, many residents criticized the renovation as merely cheap ‘face-lifting’. Almost 30 years after the first renovation, the estate again presented itself in a poor state of repair. Again the protests of experts, culture enthusiasts, as well as of residents, led to a renovation. This second renovation, aimed at securing the structural integrity and aesthetics of the structures (including erasure of individual adaptions; started in the summer of 2011 and is expected to be finished in 2016. 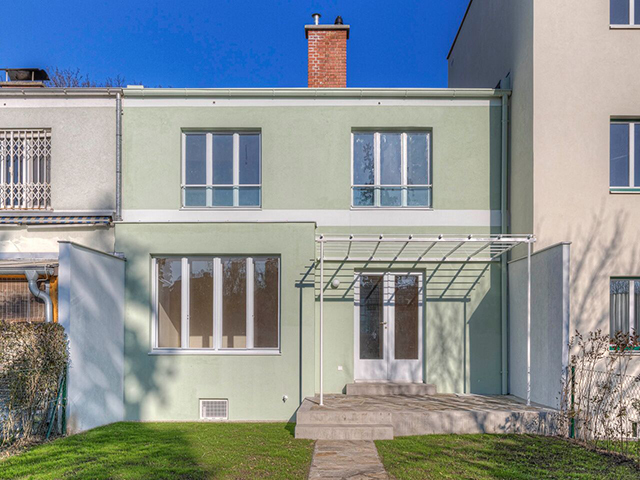 Whereas the first renovation project was underfinanced and limited to the exterior of the houses, the second is more thorough (budget 10.000.000,- €; renovation costs are approximately 2.700,- € per m²) and also involves indoor improvements – which is reflected in higher rental costs, especially for new leases. Fig. 03 - The ‘Wlach-house’ after renovation showing the object in ‘(a)historical purity’. The first renovation already entailed a greater awareness and appreciation of the estate (among locals and residents) as well as an increase of visitors. But in the course of the second renovation the estate’s publicity attained new heights. The exhibition in the Wien Museum celebrating the estate’s 80thbirthday in 2012 undoubtedly marked the peak of public attention. Accompanied by a comprehensive catalogue (Nierhaus and Orosz, 2012) and keen media coverage (including social media), this event was not only a feat in terms of educating the public about the value and meaning of these historic buildings (its naturalization as cultural asset), but also a trigger for further architectural tourism. Moreover, guided tours offered by the Viennese Centre of Architecture and the existence of three websites – two privately operated sites were outshone by an official website launched in 2012 also including a mobile app for a highlights’ on-site tour – bore witness to the estate’s status as icon of modernist architecture, but also to its increasing use as a resource in political self-display and city marketing (Aigner, 2015a). In the case of the 48 up-valued council houses, this coming together is, however, more complex. Here, conditions for an exclusive appropriation are to be created actively. The communal property management has to become a part of the game – has to share the dominant (expert) values and to adapt the allocation guidelines in order to select ‘suitable’ tenants. This happened in the course of the second renovation. A rigorous tenant screening process started in 2012, on the occasion of new letting of some freshly renovated homes, privileging those who show high affinity towards architecture. With this new selective strategy of renting, authorities supported a socio-structural change or, to describe it more critically, the exclusion of those who are in need of support. But exclusionary effects also arise from higher rents. The Vienna City Councillor for Housing(a representative of the ruling Social Democratic Party) initiated the estate’s separation from the council housing stock and its management by a limited company (WISEG)6– which not only makes it easier to perform the challenging renovation task, but also makes it possible to lease newly renovated houses at a market-oriented price. High rents – new lease contracts can reach over 2000,- Euro per month (the treble or quadruple of old contracts) – are the main factor for the exclusion of low earners in search of a home7. As the houses are not affordable for people coming from low-income strata, the basic principle of social housing policy is undermined. The new framework conditions favour the favoured and discriminate the disadvantaged – and they do this in the name of culture. Because the appropriation of houses with monument status presupposes very specific dispositions and competences that are not distributed universally, the Werkbund houses become subject to exclusive appropriation and, because they function as cultural capital, they yield a profit of distinction for cultured middle-class people (Bourdieu, 1984:228). For those with old lease contracts who lack these special competences and for whom the cultural value of architecture is of no importance, the user value of the houses matters most. They see their houses simply as home – as a long-term tenant put it: “I do not have the feeling that I live in a monument, it is just my home”. Whereas prospective tenants are susceptible to the name of famous architects – the Werkbund houses were designed inter alia by well-known architects like Josef Hoffmann, Adolf Loos, Josef Frank, Gerrit Rietveld, Hugo Häring or Margarethe Schütte-Lihotzky –, some long-term tenants are unaware of the architect of their homes. These different types of residents showing different value orientations, attitudes and appropriation practices, require further examination. Two user profiles will be presented and discussed in more detail on the basis of a theoretical concept of habitation inspired by Bourdieu. Habitation is considered here as a coming togetherof two mutual structured and structuring structures8.On the one hand, we have the structure of the resident, considered by Bourdieu as “habitus” – a set of acquired dispositions,bodily skills, preferences, tastes, and other non-discursive knowledge that might be said to ‘go without saying’, whichdetermine9, among other things, how an agent selects and appropriates a dwelling. On the other hand, we have the modern house as an aesthetic pre-structured object with specific requirements inscribed (Bourdieu, 1979). Especially in the case of a listed building there are not only demands deriving from the object’s physical condition, the rooms’size, cut, and arrangement,but also implicit and explicit rules deriving from monument status.A dwelling that has been placed under national monument protection wants to be treated in a very specific way. It should be kept in (or restored to) its ‘original appearance’, demands a certain knowledge and art of living and imposes on its occupants. This model of two mutual structuring structures not only helps us to break with the everyday notion that we are free agents when we choose, furnish and decorate a home, but it also prevents us from the erroneous belief that an empty house or apartment awaiting its occupants is a neutral situation. Bearing this in mind, the following presentation of a ‘good match’ and ‘bad match’ does not constitute an evaluation but rather an analytical statement in terms of compatibility of two structures. It is not by chance that architects belong to those residents who strongly advocate compliance with preservation rules10. As connoisseurs and lovers of modernist architecture, they are, in a certain sense, the ideal users. They not only possess the necessary aesthetic disposition to appreciate and inhabit these houses, but they also have the special know-how that is helpful for renovation and maintenance work. Let us consider a female architect, hereinafter called Tilda, in more detail. Tilda knows the Werkbund estate since childhood. She visited a befriended resident from time to time with her mother. As a student of architecture, she went for walks and made drawings on site. Thus, she acquired her love for the modernist ensemble that in her eyesis a “mecca for architects”. After an unsuccessful attempt to rent a council house in the 1990s, she grasped the opportunity in 2000 to buy a row house designed by Gerrit Rietveld – one of the most spacious Werkbund houses comprising five split levels with 96 m² ofliving area (130 m² including cellar). As an admirer of this well-known architect, she made the decision to purchase without having inspected the house (“I absolutely wanted it”). A clear case of blind love, but reality soon caught up with her. After clearing out, she realized the run-down state of the house and was distraught temporarily when faced with extensive, as well as expensive, renovation work (“The house looked like a ruin. Total despair”). But Tilda overcame all difficulties, as she had a clear goal in sight: to restore this run-down architectural jewel to new splendour. She was not driven by creative self-realization but by the idea “to return the house to its original state”. Tilda’s strategy of appropriation could be described as ‘reconstruction of an artwork’. As, in her eyes, a lot of what constitutes modernist architecture was destroyed, she spent a lot of money and energy in a renovation reconstructing ‘the original’. Therewith, she did not simply follow the requirements of monument protection or prescribed measures ‘from outside’. It was more of a power ‘from within’, a professional ethos that forced her to “restore the house in the sense of Rietveld”. It can be assumed that she would have taken the same measures in the event that her house were not under monument protection. She restored and reconstructed details – from window frames, to fittings, and floor covering – with the greatest care and sparing no expenses. Almost tenderly, Tilda runs her hand over the restored radiator when describing her endeavours. In order to find out the original colour of the doors and floor covering, she even did literature research and archive work. The national monuments agency supported her ‘archeology’ with expert opinions, and she received some financial help from the Viennese fund for historic preservation. After successful renovation, she is proud now to live in an artwork. She respects the house’s original features and gains a great deal of pleasure from it. That Tilda possesses the taste that equates with the house’s original aesthetic is particularly obvious in her furnishings and interior design. The whole house conveys the impression of clear order. Like the architecture, the furniture is kept simple, although most of the individual pieces are timeless design classics – a leather suite designed by Le Corbusier, a glass table designed by Norman Foster, Eames-chairs and so on. The pieces are carefully chosen, not too big, but appropriate to the rooms’ proportions. As an architect, Tilda has acquired an aesthetic attitude that allows her to make every purchase and placement of an item to a subject of aesthetic decision. But the recognition of her house as a historically important building also allows her to frankly accept its imperfection. Like the owner of a classic car, she does not suffer from its deficiencies – the narrow steep little steps, the bad thermal insulation properties, the windows that need to be repainted every few years with an old colour mixture, and so on. The recognition and treatment of her house as an artwork even demands decisions following the primacy of form over use value. For reasons of reconstructing the original appearance, she was prepared to lay a linoleum floor that she herself found to be “impractical”. In actual fact, Tilda does not simply feel like an owner but rather as somebody who preserves a treasure for future generations. This also relates to her “philosophy” to make her house accessible and come alive to others, especially to students. Whenever possible she is prepared to guide interested visitors through her house. Thus, she uses her house not just a space for living but also makes it an exhibition piece. “Heritage depends on display”, Barbara Kirshenblatt-Gimblett pointed out (1998:XXV), and Tilda really does a lot of display work. 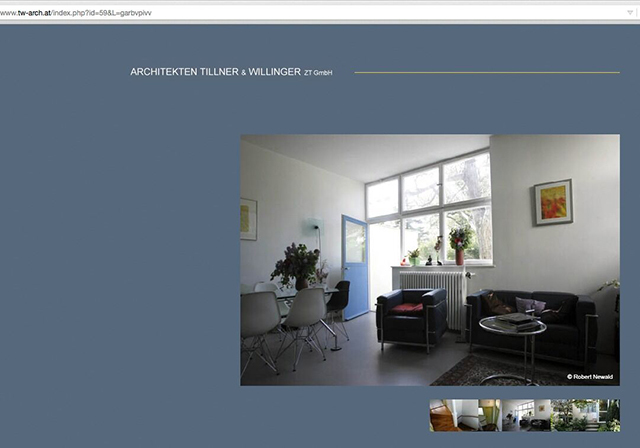 She not only shows her house to visitors, she also reports on her renovation project in expert lectures, in newspaper, on television, on YouTube and on her professional homepage . With her ‘display activities’ Tilda wants to set a good example for other residents. Her aim is not to control her neighbours (“I do not want to play monument police”) but rather to convince and motivate with positive example. Fig. 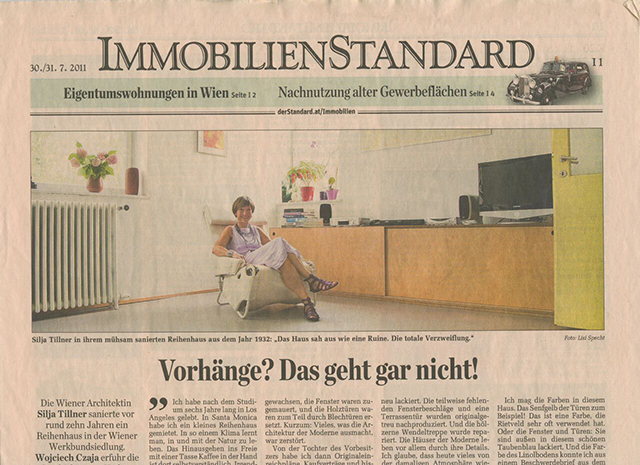 06 - Home-story in an Austrian daily reporting on Tilda’s renovation endeavours, Der Standard 30/31 July 2011. Like some of the other residents of the estate, Tilda is a ‘connoisseur resident’ who expects ‘correct’ treatment of the buildings from the neighbours. Such connoisseur residents are painfully embarrassed when tourists visit other Werkbund houses, which, in their eyes, are not ‘correctly’ inhabited. The cultivated residents hold that ‘wrong’ residents, who have not the right taste and love for this architecture, are the basic problem of the estate. In their eyes, it is only a question of finding the ‘right’ owners and tenants – able to appreciate the houses and willing to keep them in the ‘original state’ – to achieve the ideal state of an ‘authentically’ restored estate. Connoisseur residents really suffer when neighbours express their ‘bad taste’ in conversion work, home decoration, lace curtains or garden gnomes. They see any changes made to the houses as an attack on the architectural harmony of the whole, and especially rage against residents who construct extensions and garden sheds against orders. Although Tilda states that her own experiences with authorities for the conservation of historic buildingshave been nothing but positive, she is unhappy about experts’ casual attitude towards such ‘offences’. Like other architects (including those involved in the estate’s first and second general renovation), she criticizes the national heritage agency for being not strict enough. In her opinion monument preservation “should go much further, should comprise the surrounding area, the road space and gardens, but also the interior space”. Although she would not agree with prescribing residents their furniture, she pleads for a “stricter compliance with the rules”. The preservation rules11may be clear for Tilda – they are a natural part of her thought and practical sense – but for other residents they are anything but a matter of course. To better understand ‘the accused’, let us now take a closer look at Joe, a pensioner and former municipal worker. In 1985, immediately after the estate’s first renovation, he, together with his wife, took over a council house with a living area of 76 m² from relatives. The former residents, a six-person family, had constructed an extension in the 1970s in order to shelter two of their four children. Although this addition became unacceptable after the listing of the house in 1978, the owner and the responsible monument curators showed tolerance and understanding for the family’s confined living situation and did not force the tenants to remove their extension during the first general renovation. The architects in charge of the renovation pleaded for demolition, but were outvoted by the municipal owner and the heritage authorities. Unconcerned and unaware of this prehistory, the new tenants (Joe and his wife) warmly welcomed the ‘illegal’ additional space (“It was good to have one more room”). 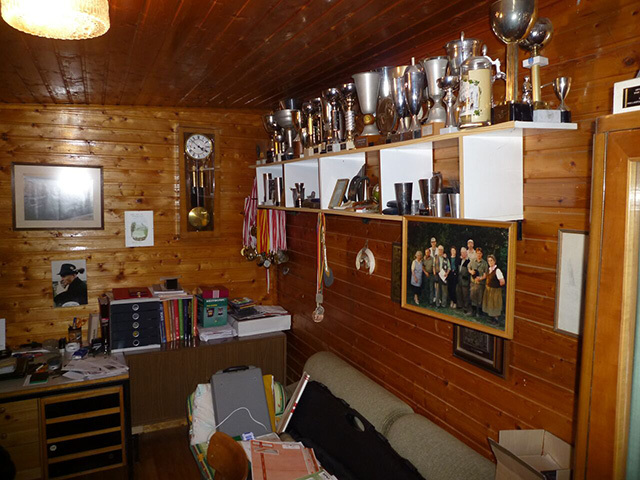 Joe uses this room as home office and has decorated it with trophies and documents reminding him of his achievements as enthusiastic sport shooter. Even if he was informed about the ‘illegal’ status of the extension at a later time, he has never had thoughts about removing it. To the contrary, he even extended the extension and fitted it with new wood panelling and rain gutters. Furthermore, in 2001, he built – also against orders and without building permit – a garage, which he was obliged to remove, following a report made by neighbours. 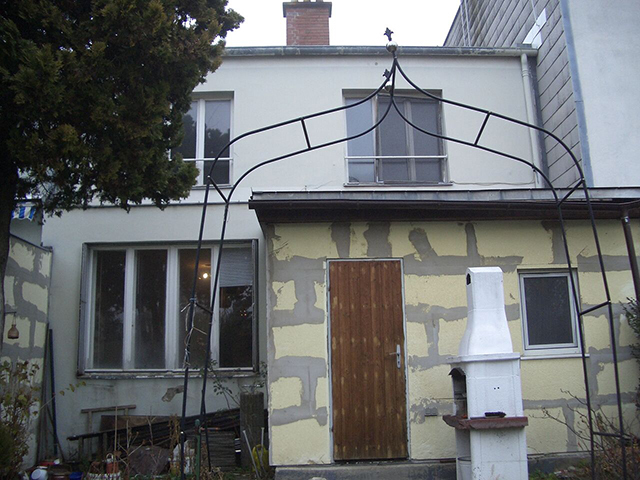 But, as a ruse, he only removed the walls up to the pillars and thus transformed a garage into a carport – for which, according to the Viennese building regulations, no construction permit is needed. These examples of Joe’s appropriation work show the complexity of monument preservation in practice – there is no strict ‘cleaning of the work’ but rather a social process of negotiation involving a variety of stakeholders and partly conflicting, side by side working authorities. Yet, and above all, they show a resident’s indifference towards the ideal world of monument preservation. Joe may follow his own interests without regard for provisions, but it is not simply egoism, stubbornness or conscious resistance and opposition towards authorities that guided his actions. That he does not meet the normative expectations of a tenant living in a monument is more a matter of his cultural means and aesthetic dispositions. According to his education and socialization, Joe is not able to experience his house as a work of architecture. He has never acquired the aesthetic eye of the culture lover, or what Bourdieu calls the “aesthetic disposition” (1984:28f) – a historically created attitude that is connected to the ability to recognise buildings as architecture and to appreciate them for their own sake. For him, his house is not a monument but simply his home. This does not mean that Joe has no idea of his house’s symbolic being. 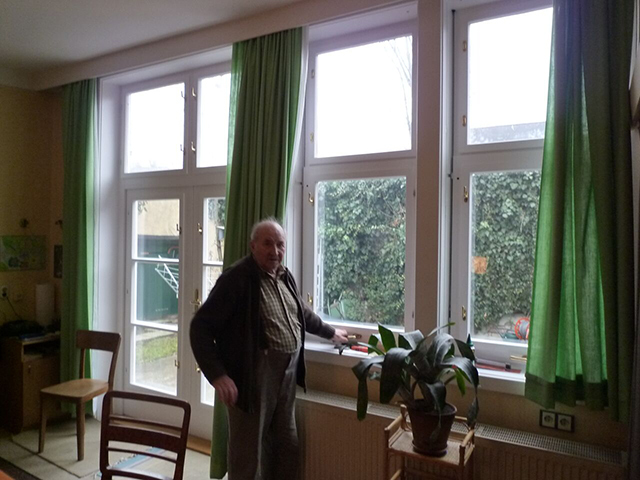 He is delighted to live in a famous estate and even collects newspaper articles dedicated to the Werkbund estate. He also welcomes the fact that the houses are placed under monument protection – not because he feels a need to preserve or restore their original appearance, but because “the houses are protected against destruction”. In the light of current speculation with real estate, he has no fear that his house will be replaced by new structures. This pragmatic utilitarian thinking (instead of the normative cultural-aesthetical) also applies to the couple’s renovation work and interior design. Before they moved in, almost thirty years ago, the house was in need of renovation work (“everything was converted badly“). Joe and his wife got down to hard work and undid some changes performed by the previous tenants. They removed a wall and a fireplace and reinstalled some doors – “not because of monument protection, but because we wanted to live more comfortably.” For the elderly couple, use value ranks higher than heritage value. Yet Joe seems to contradict himself, when he proudly argues at the same time “we have reconstructed the original state”. Knowing that restoration of the Werkbund houses to original condition is generally considered to be a good thing, he does not hesitate to interpret his undertakings against the backdrop of this ideal in retrospect. Even though some structural changes may pass as restoration measures, a closer look reveals the lack of aesthetic sensitivity, the gap between skilful and dilettantish workmanship: The reconstructed doors are of cheap chipboard coated with green laminate (instead of white varnished wood); the rustic door fittings go with the tenants’ wooden interior cladding but conflict with the clear, cubic style of the Werkbund houses. That the retired couple does not possess the taste that meets the aesthetic standards of their listed home also becomes clear in their interior design. While Tilda refuses curtains (“Curtains? That doesn’t work, no way!”) and painted the walls in white,using oldcolour mixtures corresponding the clear simplicity of modernist architecture, Joe and his wife recently purchased new curtains (also serving as sunscreen) and used patterned wallpapersto embellish their home – the walls otherwise would have remained “naked” in their eyes. Also the furniture conflicts with the modernist aesthetics and is partly not appropriate to the size of the rooms. For example, the rustic oak cupboard in the living room is so huge that it covers one door and blocks the access to the corridor. There is evidence to classify this constellation as a bad match. But what objectively can be described as a ‘bad match’, for the tenant can be subjectively experienced as a ‘good match’. Joe is very happy with his home. He has done a lot of renovation measures and improvements (e.g. a new bathroom) of which he is proud and which he can really enjoy. He also is not generally against conservation measures. He is grateful for some improvements that meet the preservation rules when paid by the Municipality of Vienna, the owner. For example, he praises the curators of monuments for having put through the reconstruction of new sash windows. He particularly values their insulating properties and that the wings (different to the cheap plastic windows installed by the previous tenants) do not disturb when open. But again, and contrary to architecture enthusiasts, he gains no satisfaction from the reconstruction of the windows’ ‘original state’ – a category and a practice that for him has no value. The word ‘class’ may have lost much of its purchase in academic, political and public life. However, differences in lifestyle, cultural tastes and practices are still linked to social position, and the ability of privileged groups to define their culture as superior to that of lower classes still remains present (Bennett et al., 2009). This can be testified not least in the realm of architectural heritage. What does it mean to live in a heritage-protected modernist estate? Among other things, being involved in a struggle for ‘culture’ that is also a struggle against ‘bad taste’. Here, compliance with aesthetic norms of an elite is required by law, less culturally inclined residents are brought to their senses. The two examples of residents living in a listed modernist estate not only illustrate that taste – understood as the skill and capacity to appropriate a work of architecture – is unequally distributed, but also that the transformation of the estate into an architectural icon (even if only of local significance) reinforces unequal treatment of people of different tastes. Renovation measures which let shine the records of modernist architecture in their ‘ahistorical purity’ witness the imposition of an aesthetic norm, or better, the imposition of the culture-ideology of a dominant class enforced by the state with the help of heritage authorities.That a very particular (situated and dated) perception of architecture and idea of preservation has prevailed is tantamount to what Bourdieu calls the“symbolic power” of culture(Bourdieu, 1993; Swartz, 1997). This power has a veiling effect. It veils the ideological assumptions underlying monument preservation (Smith, 2006), the disciplinary effects on residents, and (in this case) the exclusion of low-income and culturally less inclined residents in the long run. For this to occur, according to Bourdieu, the real aim of cultural dominance – the enforcement of the dominant taste, the perpetuation of inequality – has to be transmuted into its opposite, into a selfless love for culture, moral authority and cultural legitimacy. That is why the acceptance of ‘high-culture’ is always experienced as positive and the symbolic power of legitimate culture is not understood as violence or subjection by those who affirm it. This constructivist conclusion may be criticized for being too negative. It may be criticized for ignoring the fact thatidentification takes placeand the estate is considered ‘ours’. It is true that monument status fosters identification, the residents’ pride to live in much-valued cultural objects. But this does not alter the fact, that the enforcement of the dominant taste is accompanied by effects of social exclusion and constitutes an interference with the right of free disposal over domestic space or what Schwartnig with regard to the Dessau-Törten estate calls, somewhat ponderously, “the restriction of private availability of monuments through expert judgement“ (2004b). Such a finding may provoke narcissistic injury as a knee-jerk reaction amongst experts and culture lovers, but it is actually an offer – to gain a higher degree of self-reflexivity. 1.Habitation at first sight may not be associated with consumption, but there is a tradition within anthropology and material culture studies that strongly promotes a theory of housing and habitation as a theory of consumption. Daniel Miller was one of the first who investigated the “work on the home as consumption” (Miller, 1988:354). A tradition that has recently become relevant in the academic field of architecture (Maudlin and Vellinga, 2014). 2. For the sake of clarity in understanding, each of these concepts requires a brief working definition. Canonization is used here to describe the field-internal work (mainly discursive practices) that lead to the inclusion of a building in the canon – which is a corpus of architectural works considered by authorized interpretersto be worthy of being valued, exhibited, admired and remembered for a community. A canon manifests itself in architectural guides, overview lectures or publications in architectural history for example. Publication activities of producers and reviews immediately after a building’s completion not necessarily lead to canonization, but provide a good basis. Decisive for canonization is further field-internal legitimation work performed by authorized interpreters of the architectural field at a later time. Persistent appreciation and remembrance work (often experienced as discovery) is a prerequisite for the next step: an object’s heritagization – a term widely used in heritage studies referring to the processes by which heritage is constructed (Smith 2006; Rogerio-Candelera, Lazzari and Cano, 2013:388f). I use heritagization here in a narrower sense – to describe the practices that lead to monument status (Choay, 2001; Swenson, 2007, 2013) and entail a particular practice of conservation. Architectural iconicity may be defined in terms of fame and special symbolic/aesthetic significance, but I propose to consider iconization as a process of popularization in which field-internal recognition (of buildings and its producers) is converted into prominence among a wider public. Contemporary attention-seeking buildings, which are conceptualized as an icon from the very outset, are main focus of recent research (Sklair, 2006, 2010, 2012; Jones, 2009), but there also exist objects which becomeicons (and may be termed as Iconic III). They reach this ascription in the course of extensive mediatisation (coverage in the daily press, magazines and TV, exhibitions, websites etc.) – all in all dissemination work, which is mainly performed by “intermediary agencies” (Bourdieu) and, increasingly, agents outside expert-culture. 3. The Gemeinnützige Siedlungs- und Bauaktiengesellschaft (GESIBA), or public utility settlement and building material corporation, was founded in 1921 as a self-help organization by the ÖVSK (Austrian Union of Settlement and Allotment Gardens), the Austrian Republic and the City of Vienna in order to provide settlers and housing cooperatives with construction material. 4. As the legal protection of tenants in Austria allows only a small increase in rent (just adjusting to inflation) and guarantees council tenants a contract with no time restriction, some tenants have inhabited their houses in the modus of home ownership and showed great willingness to invest and adapt. 5. Philippe Boudon (1972 ) firstly addressed the question of alterations by using the example of the Quartiers Modernes Frugès (1928) in Pessac;more recently, Andreas Schwartnig (2004a, 2004b, 2008) discussed the conflicting interests of users and experts by taking the example of the Dessau-Törten estate. 6. WISEG (Wiener Substanzerhaltungsg.m.b.H. & Co KG), a real estate company majority-owned by the City of Vienna, is the owner of 48 Werkbund houses since 1 January 2011. 7. Because subsidised refurbishment only allows benchmark rents, new tenants do not pay the full amount of lease during the period of loan repayment (15 years) – for example about 1.400,- € instead of 2.070,- € for one of the largest houses with 96 m² (excl. 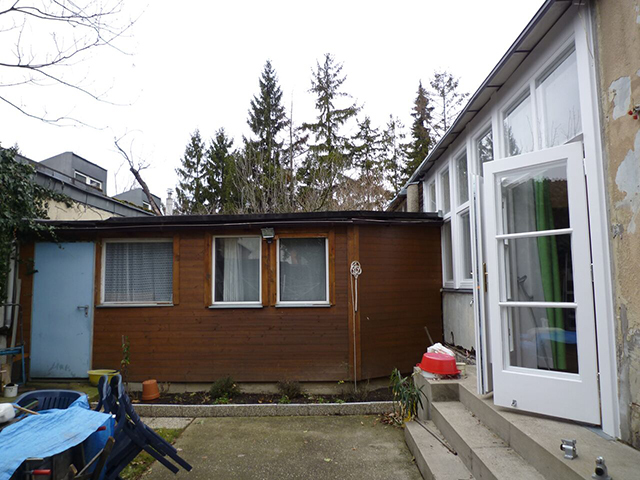 cellar) or 1.085,-€ instead of 1.512,- € for a smaller house with 65 m² living space. In the case of existing contracts, renovation measures cause a considerable increase in the lease (including now the repayment rate for the renovation loan) for 15 years – which is also a trigger for some tenants to move out. Until now, seven units changed hands during the second still on-going general renovation. 8. It is state of the art, not least in anthropology and material culture studies (Miller, 1988, 2002; 2010), to understand habitation resp. accommodation as a reciprocal process. A lot of theoretical work, especially when based on actor network theory, is devoted to overcome the ‘common-sense’ resistance to the idea of objects in and of themselves possessing agency. Even though reference to reciprocity is often made, a more nuanced theoretical view – as provided with Bourdieu’s idea of two structuring structures – is often lacking. 9. Dispositions are neither meant as fixed nor as determining in a narrow sense. The habitus is malleable and modifiable within certain limits and also allows (like language) a variety of creative decisions and configurations within the (dated and situated) realms of limited possibilities. 10. At the moment there are three living in the estate. 11. There are no explicit operational rules for preservation and conservation management laid down in the Austrian heritage protection law. If experts of the Austrian Federal Monuments Office (Bundesdenkmalamt BDA) issue the administrative decision that a building is to be protected in the public interest (thus the building is declared a monument),the rule prohibiting destruction and alterations (the so-called Veränderungsverbot) applies from then on to the objects. This does not mean that structural modifications are generally forbidden, but must be negotiated and approved by the authorities for the conservation of historic buildings. The removal of structural changes is, in fact, also subject to negotiation. AIGNER, Anita – “Building Exhibition, Open-air Museum, Digital Web-exhibit: The Vienna Werkbund Estate on Display.” Austrian History Yearbook 46, Cambridge University Press 2015(b), 68-88. AIGNER, Anita – “Transformation unwanted! 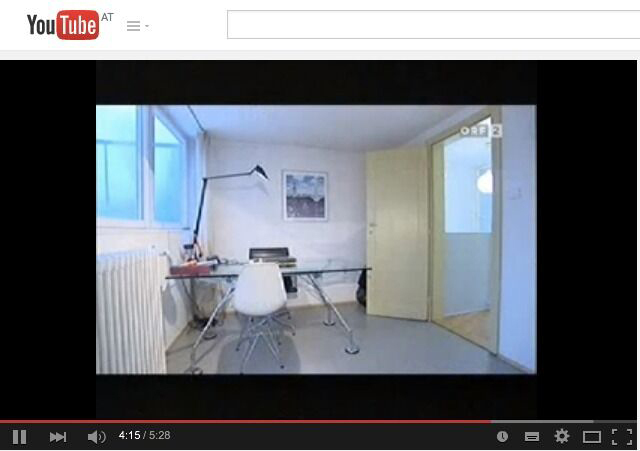 Heritage-making and its effects in Le Corbusier’s Pessac estate”, in Consuming Architecture. On the Occupation, Appropriation and Interpretation of Buildings, ed. by Daniel Maudlin and Marcel Vellinga. London: Routledge 2014, 70-88. AIGNER, Anita – “Die Denkmalwerdung der Werbundsiedlung und ihre Effekte”, in Werkbundsiedlung Wien 1932, eds. Nierhaus and Orosz, Salzburg: Mühry Salzmann, 2012, 266-275. BENNETT, Tony, Mike Savage, Elizabeth Silva, Alan Warde, Modesto Gayo-Cal and David Wright – Culture, Class, Distinction. London: Routledge, 2009. BOURDIEU, Pierre – Algeria 1960. The Disenchantment of the World, The Sense of Honour, The Kabyle House or the World Reversed, Essays, Cambridge: Cambridge University Press, 1979. BOURDIEU, Pierre – Distinction. A social critique of the judgement of taste, Cambridge/Mass. : Harvard University Press, 1984. BOURDIEU, Pierre – The Rules of Art. Genesis and Structure of the Literary Field. Stanford: Stanford University Press, 1992. BOURDIEU, Pierre – The field of cultural production, New York: Columbia University Press, 1993. CHOAY, Françoise – The Invention of the Historic Monument. Cambridge: Cambridge Universty Press, 2001. FRANK Josef – Die internationale Werkbundsiedlung Wien. Neues Bauen in der Welt, Bd. IV. Wien: Schroll, 1932. HALL, Stuart, ed. – Representation. Cultural Representations and Signifying Practices. London: Sage, 1997. JONES, Paul – The Sociology of Architecture. Constructing Identities. Liverpool: Liverpool University Press, 2011. KIRSHENBLATT-GIMBLETT, Barbara – Destination culture. Tourism, museums, and heritage. Berkely: University of California Press, 1998. MAUDLIN, Daniel and Marcel Vellinga (eds.) – Consuming architecture. On the occupation, appropriation and interpretation of buildings. London: Routledge, 2014. MILLER, Daniel – “Appropriating the State on the Council Estate“, Man 1988, 23(2): 353-372. MILLER, Daniel – “Accommodating”, in Contemporary Art and the Home. Edited by Colin Painter. Oxford: Berg, 2002, 115-130. MILLER, Daniel – Stuff, Cambridge: Polity Press, 2010. NIERHAUS, Andreas and Eva-Maria Orosz (eds.) – Werkbundsiedlung Wien 1932. Ein Manifest des Neuen Wohnens. (Exhibition catalogue of the same named exhibition in the Wien Museum, 6 September 2012 – 13 January 2013). Salzburg: Mühry Salzmann, 2012. ROGERIO-CANDELERA, M.A., M. Lazzari and E. Cano (eds.) – Science and Technology for the Conservation of Cultural Heritage. London: CRC Press, 2013. SAUER, Barbara – „Licht Luft, Sonne im modern eingerichteten Eigenheim. Die ersten Bewohnerinnen und Bewohner der Werkbundsiedlung,“ in Werkbundsiedlung Wien 1932. Ed. by Andreas Nierhaus and Eva-Maria Orosz, Salzburg: Mühry Salzmann, 2012, 260-265. SCHWARTNIG, Andreas – “Making a Home of Modernism. Architectural alterations in the Dessau-Törten Siedlung, 1928-2007”, in The Challenge of Change. Dealing with the Legacy oft the Modern Movement. 10th Int. DOCOMOMO Conference. Ed. by Dirk van den Heuvel et al. Amsterdam: IOS Press, 2008, 413-415. SCHWARTNIG, Andreas – “Wohnen in einer Versuchssiedlung. Zur Problematik der baulichen Veränderungen in der Siedlung Dessau-Törten”, in: Magdalena Droste, Adolf Hoffmann (eds. ): Wohnformen und Lebenswelten im interkulturellen Vergleich. Frankfurt am Main 2004a, 255-276. SCHWARTNIG, Andreas – “Wohnen im Monument. Zur Einschränkung der privaten Verfügbarkeit über Denkmale durch Expertenurteil und öffentlichen Anspruch am Beispiel der Siedlung Dessau-Törten”, in Das öffentliche Denkmal. Denkmalpflege zwischen Fachdisziplin und gesellschaftlichen Erwartungen. Ed. by Thomas Will, Dresden 2004b, 107-113. SMITH, Laurajane – Uses of Heritage. Abingdon: Routledge, 2006. SKLAIR, Leslie – “Iconic architecture and capitalist globalization”, City, 10 (1), 2006, pp. 21-47. SKLAIR, Leslie – “Iconic architecture and the culture-ideology of consumerism”, Theory, Culture and Society, 27 (5), 2010, pp. 135-159. SKLAIR, Leslie and Gherardi, Laura – “Iconic architecture as a hegemonic project of the transnational capitalist class”, City: Analysis of Urban Trends, Culture, Theory, Policy, Action, 16 (1-2), 2012, pp. 57-73. SWARTZ, David – Culture and Power. The Sociology of Pierre Bourdieu. London, 1997. SWENSON, Astrid – “’Heritage’, ‘Patromoine’ und ‘Kulturerbe’: eine vergleichende historische Semantik”, in Prädikat “Heritage”: Wertschöpfungen aus kulturellen Ressourcen. Edited by Dorothee Hemme, Markus Tauschek and Regina Bendix, Berlin: Lit, 2007, 53-74. SWENSON, Astrid – The Rise of Heritage. Preserving the past in France, Germany and England. 1789-1914. Cambridge: Cambridge University Press, 2013. Adjunct professor at the Faculty of Architecture and Planning of the Vienna University of Technology. She teaches and conducts research in the field of architectural sociology. Her recent publications address vernacular architecture and modernist housing estates. She is presently working on a book addressing the Vienna Werkbund estate as a lived-in monument.